Our year-by-year rundown started with the 1940s and ’30s and wraps up with the 1920s below. All games were played at Memorial Stadium unless noted otherwise. 1922.04.28 (FRI): The Reds’ Herb Dewitz returned the opening second-half kickoff 95 yards to the 1-yard line, setting up the only score in the Reds’ 6-0 win over the Blues. 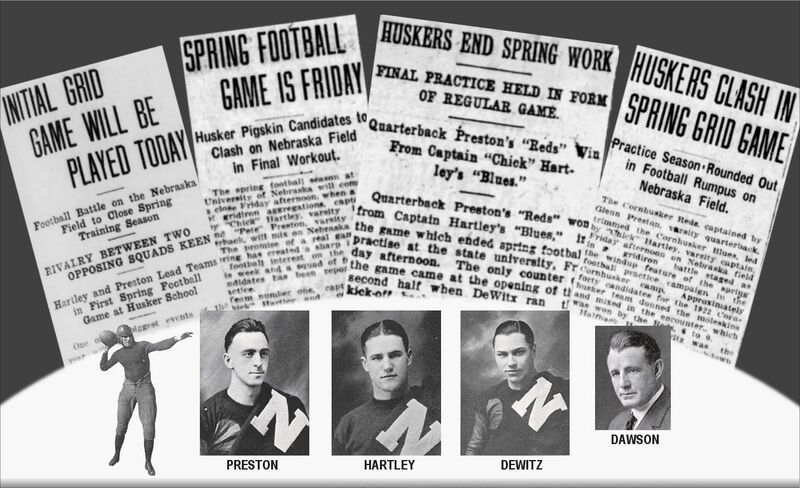 The game started at 3 p.m. and was played on old Nebraska Field. 1923: No playing field was available because of the Memorial Stadium construction project. One item of note: Assistant coach Owen Frank broke a cheek bone in a collision with a player during an April practice. 1925.03.28 (SAT): About 200 fans showed up in the rain to watch the Reds vs. Whites on the practice field at the south end of Memorial Stadium. They could also observe the track tryouts going on in the stadium at the same time. No score was kept, so it’s debatable whether this should be considered a true spring game. 1927: There would have been an intra-squad game on Saturday, March 26, but mounting injuries and a forecast for poor weather prompted coach Ernest E. Bearg to cancel it. 1929.05.01 (WED): In coach Dana X. Bible’s first season, the Reds defeated the Orange, 7-6. At least that’s the score given by the Omaha World-Herald, the Lincoln Star and the State Journal. The Daily Nebraskan said the Reds won 13-12, and its game story provides second-half scoring details that the other reports lack. 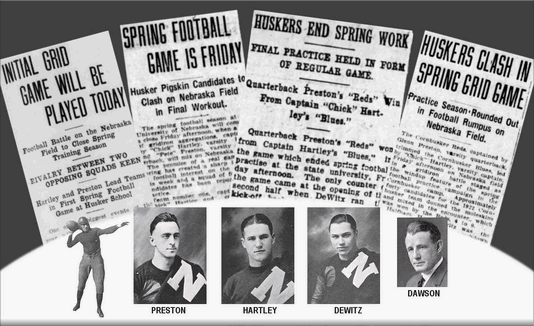 Spring drills were introduced at Nebraska in 1901, but they apparently didn’t amount to much during their first decade. Aside from an April 1906 exhibition game against Doane to test football’s sweeping new rules, no evidence of actual scrimmaging in the spring can be found before 1915. That’s the year coach Jumbo Stiehm made plans for a spring game that didn’t pan out.